WARNING The game has errors that will crash the game occasionally. It it here for archival purposes. 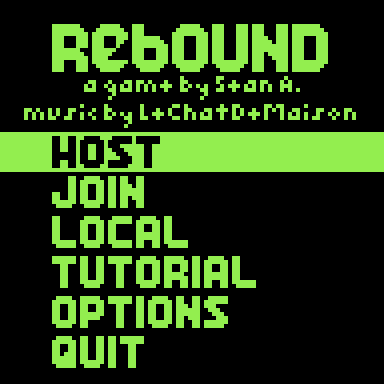 Rebound is a small game made for a contest with the theme of multiplayer. It is a strategy game similar to chess except using mirrors and light. Each “king” piece is a laser that can shoot in any direction bouncing off mirrors as it goes. 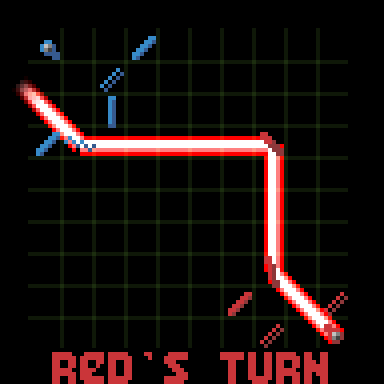 Each player has one laser piece and several mirror pieces they can position. The goal is to shoot the other players “king” with your own. The game crashes a fair amount and since the project is older I can’t go back and fix it up. I keep it here mostly for archival purposes. The game features both local and online play with two modes over a direct IP connection. It was built on top of a small networking library that handles basic network code but all the information was packed into buffers and then read on the other side by hand.